Wednesday was the day the internet stood still to protest a pair of antipiracy bills in the U.S. Congress — and it looks like it worked. Senate Majority Leader Harry Reid has postponed a vote on the PROTECT IP Act (PIPA), a much-criticized bill sponsored by Sen. Patrick Leahy. "In light of recent events, I have decided to postpone Tuesday's vote on the PROTECT I.P. Act," Reid said in a statement. This doesn't mean PIPA is dead, though — just sleeping for now. Reid, who supported the bill, praised Leahy's work on PIPA and stressed that there remains a need for strong antipiracy legislation. In a statement of his own, Leahy said he understood Reid's decision to indefinitely postpone the vote, but he blasted his Senate colleagues for making a "knee-jerk reaction," and said that criminals are "smugly watching how the United States Senate decided it was not even worth debating how to stop the overseas criminals from draining our economy." Leahy's full statement is after the jump. “The United States Senate has identified a problem directly affecting American jobs, American workers and American consumers. When I first came to Congress, it was the practice of the Senate to debate competing ideas to address such a problem; regrettably, that is not the practice today. “The Senate Judiciary Committee unanimously reported the PROTECT IP Act in May. Since then, I have worked with both Senators and stakeholders to identify concerns and find meaningful ways to address them. Only when the Senate considers this legislation can we do so. In the meantime, more time will pass with jobs lost and economies hurt by foreign criminals who are stealing American intellectual property, and selling it back to American consumers. I remain committed to addressing this problem; I hope other members of Congress won’t simply stand on hollow promises to find a way to eliminate online theft by foreign rogue websites, and will instead work with me to send a bill to the President’s desk this year. Thousands of websites voluntarily shut down for the day on Wednesday to protest PIPA and its counterpart in the House of Representatives, the Stop Online Piracy Act, or SOPA. Wikipedia, Reddit, and I Can Has Cheezburger were some of the big sites that went dark, while others like Google and WordPress stayed operational but posted prominent links explaining their opposition to the bills. In Vermont, local blogs Green Mountain Daily, MiddBlog and Vermont Commons joined in the so-called "SOPA strike" on Wednesday. The blackout appeared to have made a significant impact on legislators. 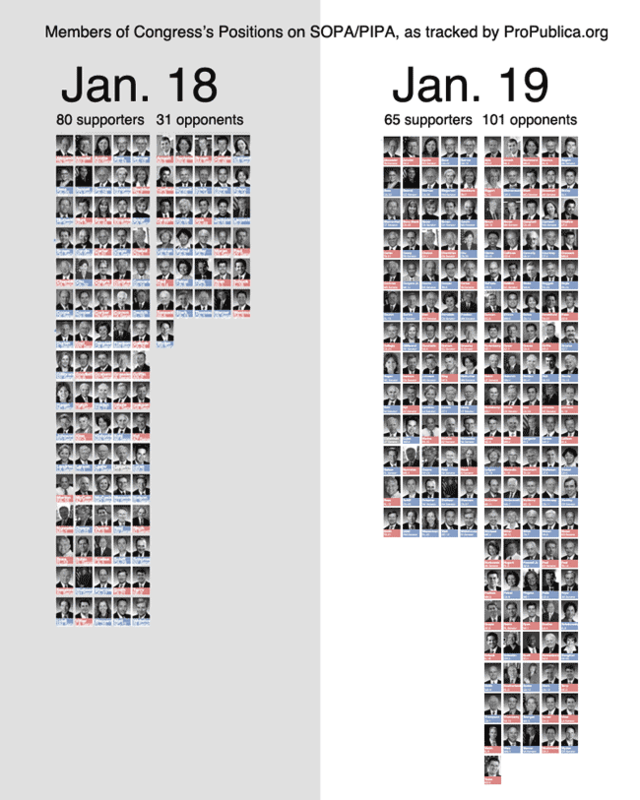 According to an infographic from ProPublica, 70 legislators announced their opposition to SOPA/PIPA on Wednesday and Thursday, including some who were initally cosponsors on their respective bills. Both Sen. Bernie Sanders and Rep. Peter Welch said that they were still undecided on the legislation last week, but both told the Burlington Free Press on Wednesday that they opposed SOPA and PIPA in their current forms. The web blackout didn't sway Leahy, though; in an interview with Vermont Public Radio yesterday, he blasted the participating sites as irresponsible and said that his legislation wouldn't affect any of the sites that were protesting. Leahy might not be happy with today's PIPA news, but many of his constituents in Vermont are. Here's a Storify I put together on Wednesday, looking at the reaction of Vermont's Twitter community. Admittedly, Twitter is a self-selecting and decidedly pro-open-internet group, but there was nary a pro-PIPA tweet to be seen.